I attended this concert with my new wife. We were married in June, 1979, a few months before the concert. She's my best friend and has been for forty years. Joni was incredible, well beyond expectations. Joni's talent is compelling. Glad she made it public. This was the concert of a lifetime for me. It was on my birthday and the first time I exerted my independence, buying the tickets and driving all the way out to Columbia to see Joni. What I didn't know was that she was touring with two other musical icons of mine, Pat Metheny and Jaco Pastorius. When they all came out on stage I jumped out of my seat and turned to the person next to me and said, "Do you know who that is? That's Pat Metheny and Jaco Pastorius!!" Of course the person next to me had no idea what I was talking about but I didn't care. I was out of my mind with joy and happiness. It was as if Joni had given me an extra special birthday gift. I never did sit down during the whole concert - it was so amazing to watch these super talented artist all creating together. As a 14 yr old going to school in Ellicott city MD, not being a good student and running away from home at the drop of a hat, I was obsessed w/ music. The school hired a new teachers aide. A wonderful, music loving, jean jacketed, geeky and super cool young woman named Lucy Jenks whom I will never forget. With her unconventional and open way of teaching- was able to help me get on track with the some of the schoolwork. This really is about Joni, but the reason I write about dear Lucy is b/c she also was a huge Joni and Roxy music fan. She made me a deal, if I could pass the year, she would take me to see Joni that summer at Merriweather. Of course w/ this sort of incentive, alas I passed the year! Everything from the sound to the lighting was beyond magical and I heard all my favorite more jazz influenced material that night. The best concert I have ever seen. Being a bass player, I was totally blown away by Jaco's solo (slang). When he kicked in the digital recorder I thought for just an instant, "Oh my god, the bass is playing itself". After building his solo to a mind numbing crescendo, he lays down the bass, walks off, then comes running out with a leather belt and goes smack, smack, smack on the bass and runs back off. What a show! The entire concert was a feast for the ears. Joni is phenomenal. I am not sure whether we went on the 22nd or the 23rd, but I took my daughter Joni just days before her 9th birthday. Yes, named after Joni Mitchell. 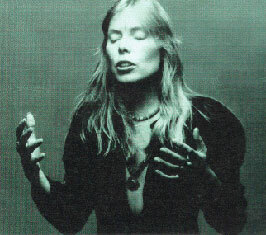 When our daughter was born in 1970, we didn't even have a Joni album, but had become fans through cover versions of her songs and liked the name. I was a "young artist" with the Wolf Trap Opera in 1979. Great concert, great band, plus the Persuasions. Well-documented on SHADOWS AND LIGHT. It was my first adult concert the after I graduated from Walbrook high school. I scrimped money from my summer job to buy the tickets after being introduced to her Mingus album and becoming a convert with BLUE. This was the first time I encountered such a complete woman and artist. My boyfriend at the time pulled out the last minute and so his mother, god bless her soul, ventured out with me to provide the ride. She knew it was important for me to experience this but she was tired after work--she slept practically through the entire thing! The show had sensitive lighting, sound and effects--an amazing performance in all aspects. Joni looked beautiful. The concert was also a showcase for the awesome talents of Jaco and Pat in separate mini-concerts within the concert. The night air was sweet and I felt that I had come of age. Spectacular evening. Stunning band. Joni's vocals were more jazz inflected than we'd been expecting but it was right after the release of Mingus so we were excited to hear where she was going with older songs infused with new angles. She seemed freer and having fun, in here element with the boys. I was high as a kite afterwards.